The Williamson County Beekeeper Association has a great deal with Avoyelles Honey Company this year for a 3 pound package with a Minnesota Hygienic Italian queen. The cost is only $55 which is pretty fantastic. Some members will be driving to pick up the bees and they will be available for pickup on April 16th. 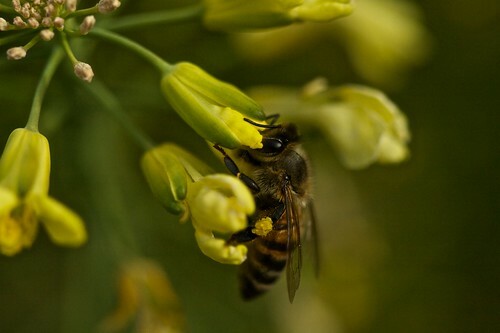 They are also doing a group order with Dadant for beekeeping supplies to save on shipping costs, and the order will be delivered at their March 22nd meeting. You do need to be an active paid member to take advantage of these opportunities, but it is only $10 per year. I have yet to make a meeting myself as they are in Georgetown, which is a bit of a drive for me, but for anyone who lives in the north suburbs of Austin, this may be more doable for you. The Austin winter so far has consisted of several days of freezing weather followed by several days of warm sunny days. One of the few plants in bloom right now is rosemary which grows great in Austin and tons of people have it planted in their yards. 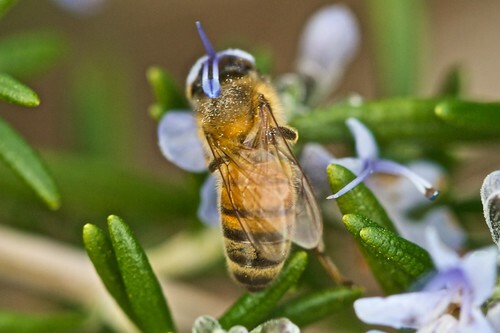 I really enjoy watching bees on rosemary blooms because the blooms are so small, and they really have to wiggle their little heads into the flowers to get the good stuff. 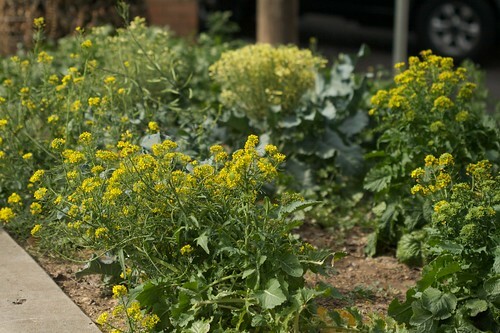 I also discovered this patch of various varieties of broccoli and cabbages gone to seed and the bees were all over it. Here is a bee navigating its way through all the stems. 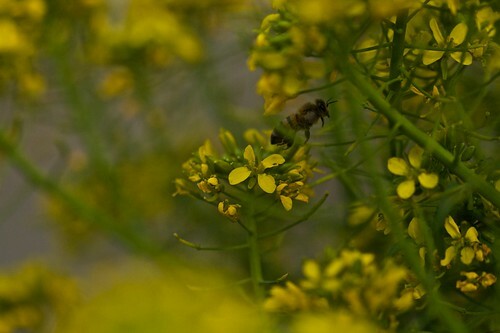 It is nice to know that even in late January there are still nectar and pollen sources to be had in the area. This bee is well on her way of filling up her pollen sacs. 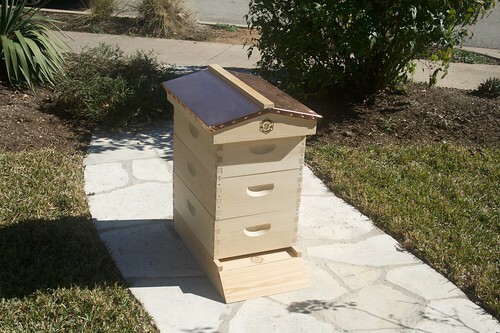 The Austin Urban Beekeeping Meetup group will be presenting a Beekeeping 101 class Saturday, February 5th at 11:00am. The class will be at the Carver Branch Library. Jim Hogg will be leading the class, and I will be helping as well. We are bringing a variety of hive types as well as all the necessary equipment needed to start your first hive. I’m expecting a rather large turnout so we’d welcome any experienced beekeepers to join us in answering questions from the group. Hope to see you there. Now is the time to start placing orders for package bees, but I thought a recap on hive placement considerations was in order. City Code – For Austin Residents, here is the code. Even if your hive location satisfies all the rules and regulations, I am of the opinion that if your neighbors aren’t cool with you having bees, you should find some place else for your hive. The decision is ultimately yours, but please at least think about what your neighbors may think especially if you live in a neighborhood where the houses are very close together. No matter what you do, your hive may swarm one season, and they may end of up in next door neighbor’s yard. Once you are sure you can put a hive in your backyard, you’ll need to find the perfect spot. Bees hate lawnmowers and will get agitated very quickly if it is an area that will be close to someone using gas or electric lawnmowers, blowers, edgers, etc. Even if you aren’t mowing your lawn, if the hive is close to a fence line, your neighbor might be. 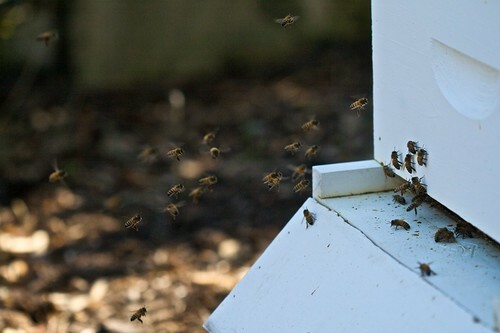 Bees also have a tendency to fly in a straight line after leaving the hive so you’ll want to make sure the location isn’t going to cause a porch or deck to be in the hive’s flight path. When I was considering the location of my first hive, I originally wanted to have it in my own backyard, but my neighbors were not too thrilled with having a hive right next door. It was probably a blessing in disguise that they initially said no. They have since said they would be fine with it, but with the lot sizes in our neighborhood (i.e. small), and the number of folks who would be mowing around the hive, it probably would have not ended well. 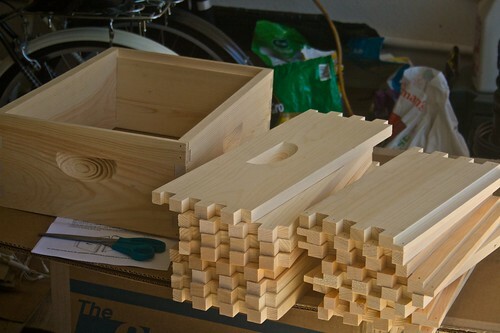 Although it didn’t feel like a winter day today, I spent the morning putting together my new hive. Based on last year’s experience with Large Marge, I bought six medium supers for the second hive. Considering last year was an exceptional year for weather and rainfall here in Austin, I think having six supers will be more than enough for a new hive starting out this spring. I bought unassembled supers this year to save on cost and shipping. 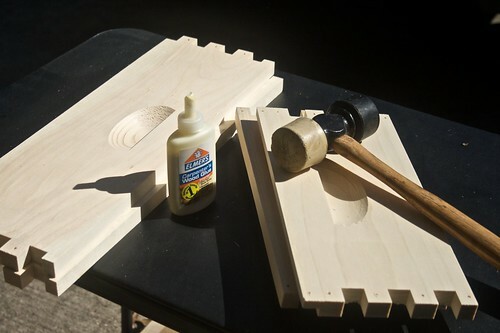 They are easy to put together with some wood glue and nails, but it is always important to assemble them soon after they arrive so the pieces do not warp. Here is a picture of the finished hive with only three supers on. I still need to paint and level out the ground at the 2nd hive location, but I’ve knocked out the big task of putting it all together. After a week of cold, wet weather here in Austin, the sun came out and the temps got up into the high 60’s today. The girls took this opportunity to get out for a cleansing flight as well as to drag all the dead bees out the hive. A fellow blogger and super gardener Pam Penick sent me this link from Garden Rant about a London based beekeeper wanting stories from urban beekeepers in the US for a book he is writing. His name is Luke Dixon, and if you are interested, you can contact him directly at Luke@urbanbeekeeping.co.uk.